This may be the last winter botany quiz for awhile, but I did come across this interesting little plant on my recent visit to Lake Tahoe that doesn’t fit neatly into any other category upon which I have (or will be) posting about. I was excited to see this plant, and I’ll be interested in seeing what others think about it. Hints: photograph taken on 03/17/2009 at Emerald Bay State Park, along Rubicon Trail, elev. 6,250′. The host is ponderosa pine (Pinus ponderosa). The usual rules – I’ll leave the photo up for a couple days to give people time to research their answer, with comment moderation turned on during that time. Whoever gets it right (or is closest in case nobody gets it right) wins, and being first is always good in case of a tie-breaker! EDIT 04/20/2009 – Wow, congratulations to, well… almost everyone, for getting this one right. I guess it was not as hard as I thought it would be, since I’d never heard of dwarf mistletoe until I ran into this plant. To be exact (something I’m fond of being), this is western dwarf mistletoe (Arceuthobium campylopodum, arse-youth-OH-bee-um cam-pie-low-POE-dum). The term dwarf mistletoe refers to the genus as a whole, while ponderosa pine dwarf mistletoe generally refers to what is now called southwestern dwarf mistletoe (A. vaginatum) from AZ and NM. Accordingly, Kirk deserves special mention for being the first to get both the common name (spelled correctly with lower case) and the scientific name, while Doug was the first to properly italicize the scientific name. I know, I’m being really picky – it’s my nature. Also, Adrian added a nice tidbit of information regarding the impact these plants can have on their hosts. I can be fairly certain about the ID, but not 100%. According to Hawksworth & Wiens (1998), four species of dwarf mistletoe occur within the Tahoe Basin. 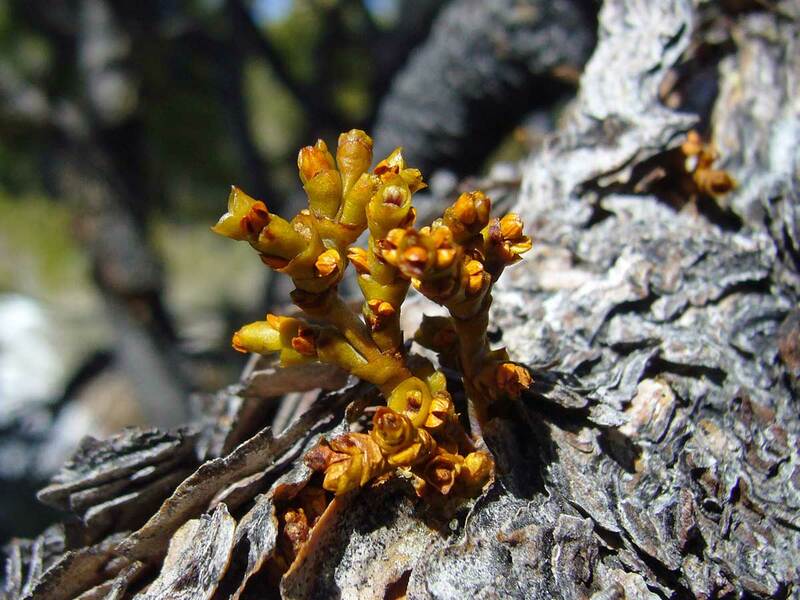 Of these, only western dwarf mistletoe utilizes ponderosa pine as a principal host. There is a small chance it could be lodgepole pine dwarf mistletoe (A. americanum), which occasionally utlizes ponderosa pine but is most often (as the common names suggests) associated with lodgepole pine. The two remaining species, fir dwarf mistletoe (A. abietinum) and hemlock dwarf mistletoe (A. tsugense), are restricted in the Tahoe Basin to white/red fir and mountain hemlock, respectively. This entry was posted in Viscaceae and tagged Botany, California, forest, Lake Tahoe, nature, parasitic plants, quiz, science, taxonomy. Bookmark the permalink. Ooo! We think we know this one — we’re guessing, Western Dwarf Mistletoe (Arceuthobium campylopodum)? How about Ponderosa Pine Dwarf Mistletoe (Arceuthobium campylopodum)? How about some kind of liverwort? Perhaps Dwarf Mistletoe, Arceuthobium campylopodum? Hey Ted, there is a little award for you to be picked from my blog. I believe it is Dwarf Mistletoe, Arceuthobium vaginatum. It causes the ‘Witches Broom’ effect in some pine, larch and fir trees. Very interesting! I suspect a mistletoe or related species. I typically thought of mistletoe through the south, but not in higher western elevations. Macros like this are really fascinating.